Do you get TICKED OFF by fleas and ticks? I sure do. With fleas and ticks a year long battle here in South Florida, I have tried many preventatives including collars, "spot drops" and sprays. I know many pet parents do not like to use harsh chemicals to keep the fleas and ticks away. If you are looking for a natural preventative, you can try Wondercide Natural Flea & Tick for Pets + Home. You can safely spray both inside your home and on your pet because it is made from food-grade ingredients. Wondercide kills on contact and repels fleas, ticks and mosquitos. If you are on Instagram, you can follow my account @oztheterrier to participate in my Wondercide's TICKED OFF contest and giveaway. My contest will start tomorrow, April 28, with my 8:30 AM EST IG post that will include the contest rules. The winner will received a "Try Everything Pack" to help protect their pets. If you are interested in Wondercide and their natural and safe products, you can visit the Wondercide website as well as follow their Twitter, Facebook and Instagram accounts. 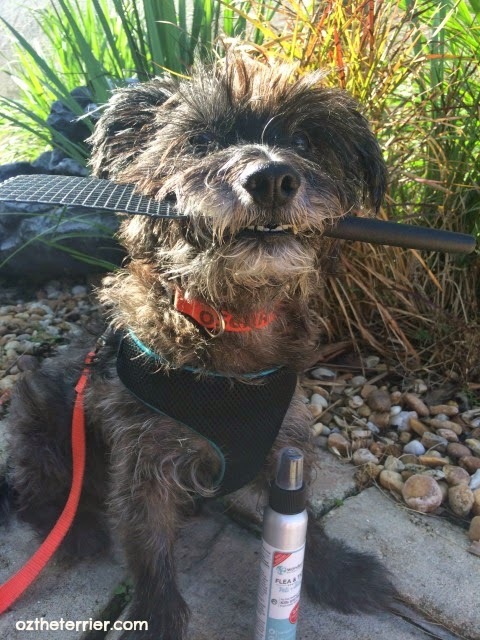 All Oz the Terrier readers/followers can purchase Wondercide Flea and Tick products - Pets + Home and Yard + Garden - with my 15% off coupon code OZTHETERRIER. I hope to see you tomorrow on Instagram! I am always looking for good flea stuffs, especially now summers on its way! what a clever idea... so that fleas have no chance to ride on the doggie-bus ... pawesome! UGH! Hate fleas and ticks!!! Such little buggers! No fleas and ticks here in the desert Southwest. Wow, nothing bugs me more than bugs! Had a tickie on me the other day and it made us all grouchy. Dang bugs! Ugh indeed. Horrid pests, are fleas and ticks!!! We detest hitchhikers on our furs! Funny thing is, my sisters and I haven't seen any ticks yet on us, but we've seen them on the humans! We can't wait to hear more abut the contest!! Ding Dong Hello O The Great and Powerful ~ Why those fleas multiply like rabbits. I don't know why those Fleas wingless insects want to make my furs their home why I don't have a sign out that say bite me! Why I say use this product and Die Fleas! Die! Die! Die! Love that picture of you Oz! We love using Wondercide! Good luck to all your giveaway participants!! Luckily fleas and ticks aren't a real problem around here! Knock on wood. We don't have fleas and ticks in our area. We did get them once a few years ago when it was VERY rainy and humid. But SHE used to have dogs who suffered when SHE lived in Sydney. They are just horrible. I can't stand fleas and ticks. Mom is pretty good about staying on top of things to keep me free of the little nuisances. hehehe love the post, I hate flea's and ticks too! That is very good advice. I don't have too much of a problem with it and just have something I do once a month. I hope yours helps you. I hate ticks, fleas and mosquitoes. We have to be careful in the ravine or up north from May on. We'll have to give that a try. Does it work on mosies too? We hate ticks. Best of luck to all who enter. Looks like you have it all figured out Oz!